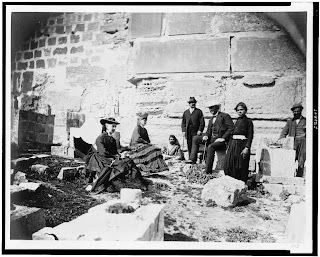 Are these Photographs of Mark Twain's Companions from The Innocents Abroad? 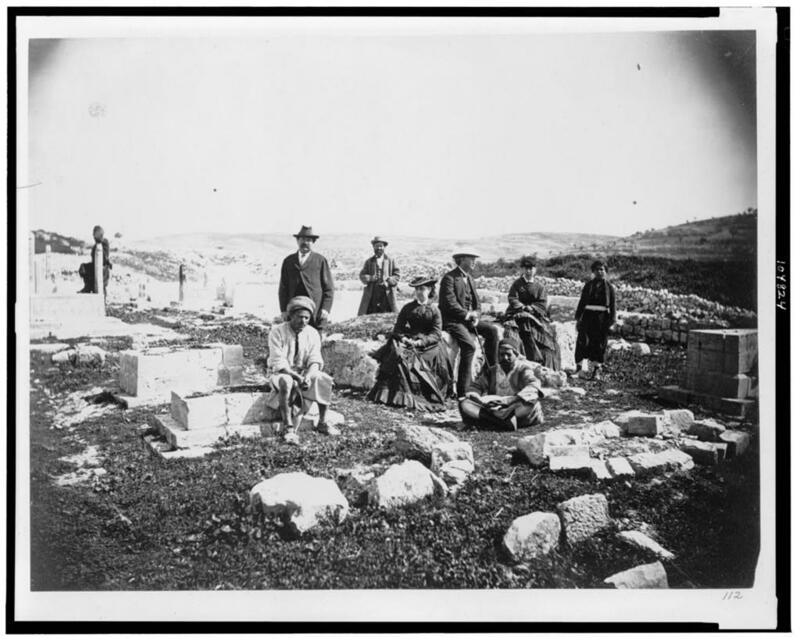 The "tourists in a cemetery outside of Jerusalem's walls,"
The book, The Innocents Abroad, based on his travels, became a best seller and established Twain as the great American writer. His vivid, iconoclastic, satiric and often depressing descriptions of the Holy Land are important historical testimony. Does the Library of Congress collection of pictures also include photographic testimony of Twain's visit? 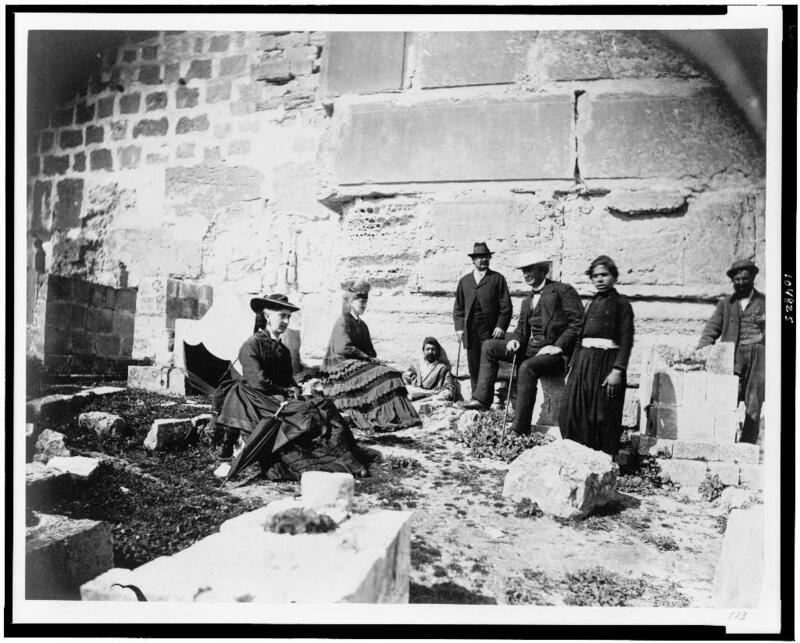 It does contains two pictures of pilgrims around the time of Twain's visit. We are exploring the possibility that these pictures are of Twain's ship mates and traveling companions from the side-wheel steamer Quaker City. 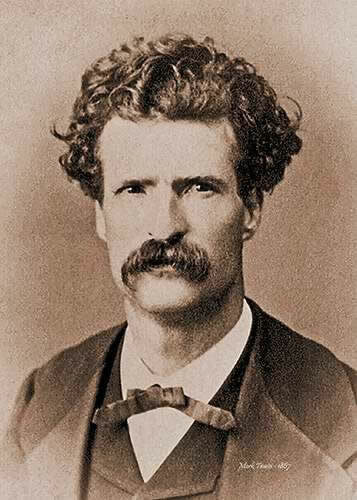 In a private letter, Twain described his travel mates as "the d--dest, rustiest, [most] ignorant, vulgar, slimy, psalm-singing cattle that could be scraped up in 17 States." The group included Charles Langdon, Twain's future brother-in-law, who introduced Twain to his sister Olivia. One of Twain's companions was Col. William Denny, a religious man who viewed Twain as a "worlding [one who is absorbed by worldly pursuits and pleasures] and swearer." Denny kept a journal and a photo album of the journey through Palestine, a collection that was recently given by Denny's descendents to the Mark Twain Project at the University of California in Berkeley. With the Denny pictures in mind, we sent the Library of Congress pictures to the general editor of the Mark Twain Project who responded, "I don't recognize any of the faces. But of course we don't have all of the 'pilgrims' in carte-de-visites [A small photographic portrait in style then]. The Denny photographs should soon be available on our website." ﻿Why do we suspect these photos, identified as being taken between 1860 and 1890, may be related to Twain or his era? Partly because of the clothing style, particularly that of two women. 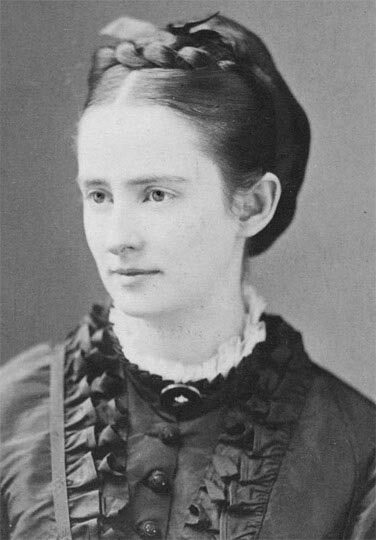 Olivia Langdon, Twain's future wife, was not on the voyage. But please compare the dresses worn by Olivia in this 1867 portrait and the dress worn by one of the "pilgrims." It seems to me that all the races and colors and tongues of the earth must be represented among the fourteen thousand souls that dwell in Jerusalem. Rags, wretchedness, poverty and dirt, those signs and symbols that indicate the presence of Moslem rule more surely than the crescent-flag itself, abound. Close by is the Golden Gate, in the Temple wall--a gate that was an elegant piece of sculpture in the time of the Temple, and is even so yet. From it, in ancient times, the Jewish High Priest turned loose the scapegoat and let him flee to the wilderness and bear away his twelve-month load of the sins of the people. If they were to turn one loose now, he would not get as far as the Garden of Gethsemane, till these miserable vagabonds here would gobble him up,--[Favorite pilgrim expression.] --sins and all. They wouldn't care. Mutton-chops and sin is good enough living for them. The Moslems watch the Golden Gate with a jealous eye, and an anxious one, for they have an honored tradition that when it falls, Islamism will fall and with it the Ottoman Empire. It did not grieve me any to notice that the old gate was getting a little shaky. A fast walker could go outside the walls of Jerusalem and walk entirely around the city in an hour. I do not know how else to make one understand how small it is. The appearance of the city is peculiar. It is as knobby with countless little domes as a prison door is with bolt-heads. Every house has from one to half a dozen of these white plastered domes of stone, broad and low, sitting in the centre of, or in a cluster upon, the flat . The population of Jerusalem is composed of Moslems, Jews, Greeks, Latins, Armenians, Syrians, Copts, Abyssinians, Greek Catholics, and a handful of Protestants. One hundred of the latter sect are all that dwell now in this birthplace of Christianity. The nice shades of nationality comprised in the above list, and the languages spoken by them, are altogether too numerous to mention. It seems to me that all the races and colors and tongues of the earth must be represented among the fourteen thousand souls. Of all the lands there are for dismal scenery, I think Palestine must be the prince. The hills are barren, they are dull of color, they are unpicturesque in shape. The valleys are unsightly deserts fringed with a feeble vegetation that has an expression about it of being sorrowful and despondent. The Dead Sea and the Sea of Galilee sleep in the midst of a vast stretch of hill and plain wherein the eye rests upon no pleasant tint, no striking object, no soft picture dreaming in a purple haze or mottled with the shadows of the clouds. Every outline is harsh, every feature is distinct, there is no perspective--distance works no enchantment here. It is a hopeless, dreary, heart-broken land. Small shreds and patches of it must be very beautiful in the full flush of spring, however, and all the more beautiful by contrast with the far-reaching desolation that surrounds them on every side. I would like much to see the fringes of the Jordan in spring-time, and Shechem, Esdraelon, Ajalon and the borders of Galilee--but even then these spots would seem mere toy gardens set at wide intervals in the waste of a limitless desolation. Palestine sits in sackcloth and ashes. Over it broods the spell of a curse that has withered its fields and fettered its energies. Where Sodom and Gomorrah reared their domes and towers, that solemn sea now floods the plain, in whose bitter waters no living thing exists--over whose waveless surface the blistering air hangs motionless and dead-- about whose borders nothing grows but weeds, and scattering tufts of cane, and that treacherous fruit that promises refreshment to parching lips, but turns to ashes at the touch. Nazareth is forlorn; about that ford of Jordan where the hosts of Israel entered the Promised Land with songs of rejoicing, one finds only a squalid camp of fantastic Bedouins of the desert; Jericho the accursed, lies a moldering ruin, to-day, even as Joshua's miracle left it more than three thousand years ago; Bethlehem and Bethany, in their poverty and their humiliation, have nothing about them now to remind one that they once knew the high honor of the Saviour's presence; the hallowed spot where the shepherds watched their flocks by night, and where the angels sang Peace on earth, good will to men, is untenanted by any living creature, and unblessed by any feature that is pleasant to the eye. .... The noted Sea of Galilee, where Roman fleets once rode at anchor and the disciples of the Saviour sailed in their ships, was long ago deserted by the devotees of war and commerce, and its borders are a silent wilderness; Capernaum is a shapeless ruin; Magdala is the home of beggared Arabs; Bethsaida and Chorazin have vanished from the earth, and the "desert places" round about them where thousands of men once listened to the Saviour's voice and ate the miraculous bread, sleep in the hush of a solitude that is inhabited only by birds of prey and skulking foxes. Palestine is no more of this work-day world. It is sacred to poetry and tradition--it is dream-land.